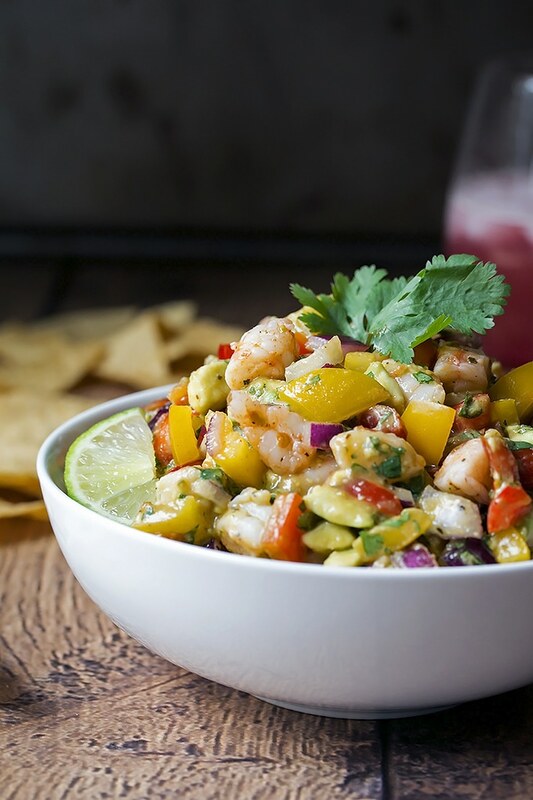 A mouth watering avocado salsa with diced peppers, tomatoes, cilantro, onions and flavorful cajun prawns. 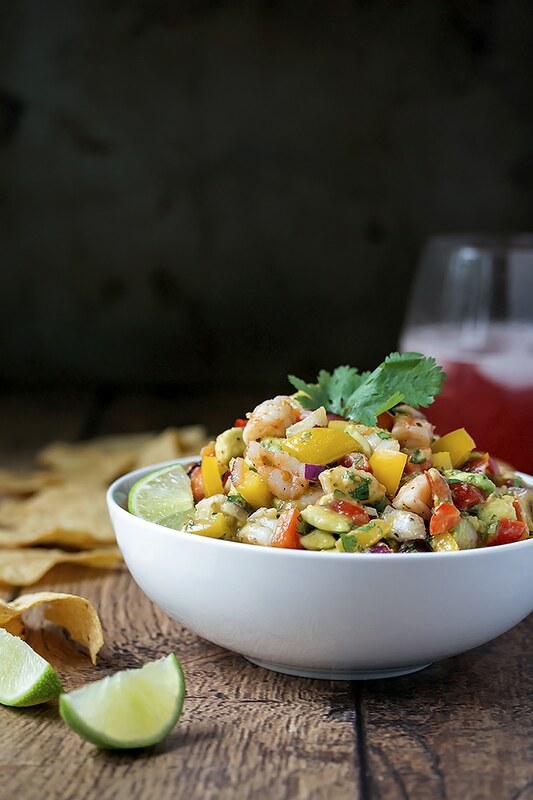 A wonderful seafood twist on the classic salsa. 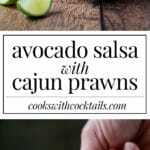 Wait till you try this avocado salsa! I mentioned before that I’m not a really big seafood fan, but I could eat this all day long. Debbie made this last weekend when we were at her place making copious amounts of Gyozas. I couldn’t believe how good these little bites tasted! And my daughter shocked me and couldn’t stop eating it too! She is so picky and she NEVER eats seafood OR salsa OR avocado. EVER. And she was eating this avocado salsa all up. 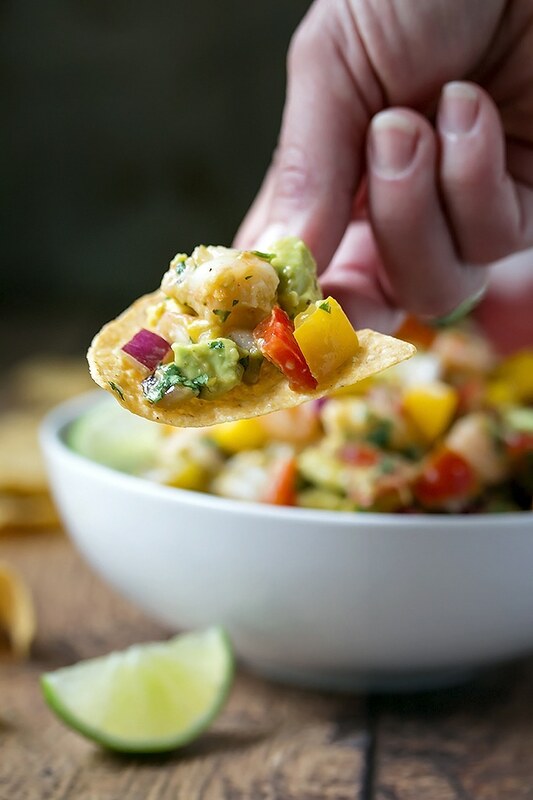 You can eat this avocado salsa with tortilla chips or like I did with gluten free crackers. You could also top little croustinis with it if you don’t care about eating gluten. I have 3 girlfriends that have been my best friends for 20 years. Jen, Liane, and Dayna. The 4 of us have been tight since we were 14 in high school. In the last number of years we have sometimes gone a month or two without getting together. So we decided to implement a monthly dinner date so that we don’t let life get in the way for longer than that :). Sometimes we go out for dinner and drinks, and other times we have a more casual dinner at one of our houses. Nutrition and clean eating are important to all of us so this avocado salsa is definitely going to be on the menu for our next date. I cant wait to share it with them and whoever else reads this blog ;). You all will be blown away by how easy it is and how damn good it tastes! Heat the Olive Oil in a pan on medium heat. Add the Prawns when the Oil is hot and sprinkle right away with the Cajun Seasoning. Prawns cook quickly so make sure you dont over cook them. Just about 3 – 5 mins is all you need. Then set aside to cool. In the meantime, dice your Onion, Red Pepper, Tomato and Cilantro. Add these to a bowl and juice your Lime over the veggies. Cut your Avocado in half and take out the pit. My favorite way to dice an Avocado is to take a sharp knife and with the skin on, slice through the Avocado in strips and then again across. Then take a spoon and scoop the flesh out. It will be all nicely diced for you. Ill post a picture of this later. I forgot to take one tonight. Add the Avocado to the mixture and stir to coat it with the lime juice. Remove the tails from the Prawns if you havent already and chop the Prawns into small pieces a little bigger than the diced veggies. Add them to the mix. Season with Salt to taste and then spoon over crackers, tortilla chips, salad, or whatever else. Sprinkle a little chopped Cilantro over top if you want to be fancy. Or dont, it tastes the same lol.